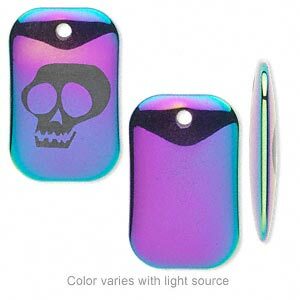 Focal, Hemalyke (man-made), rainbow coating, 35x22mm rectangle with skull. Sold individually. 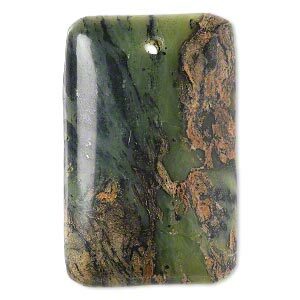 Item Number: H20-5090PB Have a question about this item? Hemalyke with electroplated rainbow coating casts an eye-catching blend of metallic purple, blue, green and gold hues. 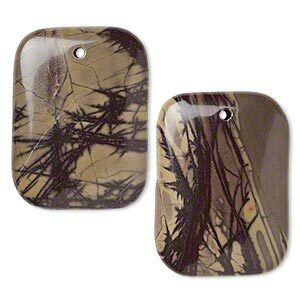 Durable material comprised of the same chemical properties as the natural gemstone, hematite. Exclusive etching appeals to both the young and the young at heart. Design copyrighted by Fire Mountain Gems and Beads, 2008. 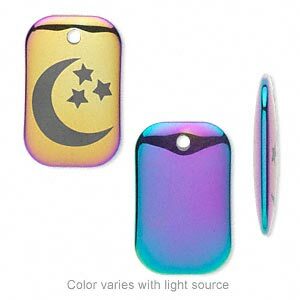 Focal, Hemalyke (man-made), rainbow coating, 35x22mm rectangle with moon and stars. Sold individually. 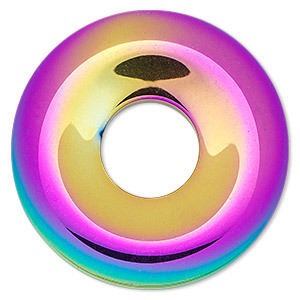 Focal, electroplated Hemalyke (man-made), rainbow, 41mm donut. Sold individually. 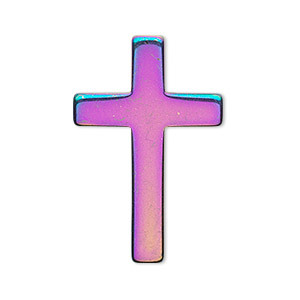 Focal, Hemalyke (man-made), multicolored, 34x22.5mm top-drilled cross. Sold individually. 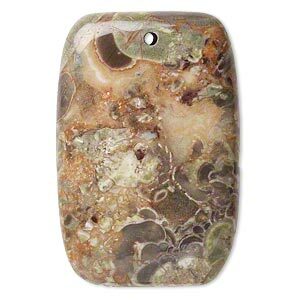 Focal, rainbow rhyolite (natural), 45x30mm hand-cut top-drilled rectangle, B grade, Mohs hardness 6-1/2 to 7. Sold individually. 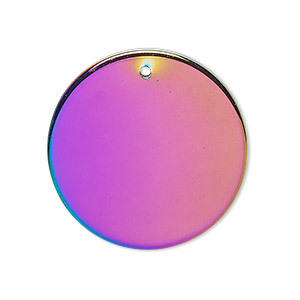 Focal, electroplated Hemalyke (man-made), rainbow, 30mm flat round. Sold individually. 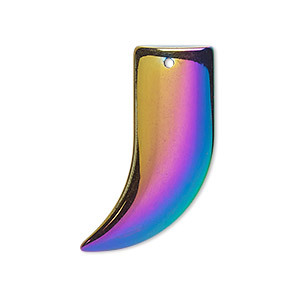 Focal, electroplated Hemalyke (man-made), rainbow, 30x19mm talon. Sold individually. 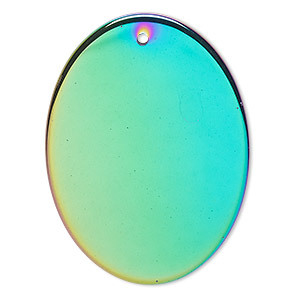 Focal, electroplated Hemalyke (man-made), rainbow, 40x30mm flat oval. Sold individually. 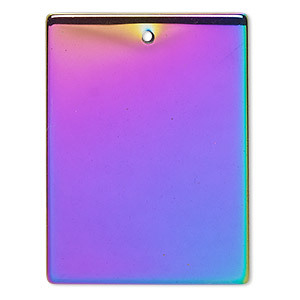 Focal, electroplated Hemalyke (man-made), rainbow, 40x30mm flat rectangle. Sold individually. Focal, purple creek stone (stabilized), 40x30mm rectangle, B grade, Mohs hardness 3-1/2 to 4. Sold per pkg of 2.